As chairman of the Manila Summit Conference of 1966, it is my pleasure to assume this position by the unanimous consent and approval of the members of this conference. I extend my thanks and the gratitude of my people to the Prime Minister of New Zealand for his generous remarks and to the other members of this conference for their unanimity. I greet the heads of state and the heads of government who are here as our guests, their ladies, the foreign and other ministers, the distinguished guests and our friends. For the times are historic and today is a historic day. Perhaps many of us may have missed it, but today is the anniversary of the United Nations Organizations, an organization to which humanity clings its hopes for universal brotherhood, for stability and lasting security for all mankind. But since the beginning of time, the wisest of men had sought to solve the riddle of peace and failed. And so even today, as if mankind drifts in the sea of inertia, man has problems that are sought to be solved with old solutions, and novel questions are answered with ancient formulas. Man who has mastered the firmament and solved the riddle of the atom still seems to grovel at the feet of his ancient enemies—war, hunger, disease. Man, the master and the king of all creation, is still a slave of his own heritage. For is it not a paradox that in a world of plenty there is want, in a world of science there is disease, in a world of understanding there is war? So, today, the seven nations here gathered have come to raise their voices for more food for the needy, for enlightenment for the illiterate and for the cure of the sick, as well as for peace in this world. Seven nations have come to this ancient capital of our nation, with only one thought in mind, and that is, that on Asian initiatives, we seek to lay the basis for the solution of Asian problems. This historic occasion is indeed the first meeting of the seven nations in Asia, called upon the suggestion of Asian nations. Today is the first attempt of Asia to initiate such a gathering not only to seek to terminate an existing conflict but to establish understanding amongst men. And at the same time, to arrive at a re-assertion of the ideal and the principle for which humanity may best be remembered in our century, and that is, the acceptance of international responsibility for the entire human family. For from Asia has come and will come, if not aborted, the gravest threat to mankind. The chronicle of the annals of man may well seek in vain for any other parallel in history. For; this indeed is an occasion in which we seek to advance the frontiers of nobility. On behalf of my people, therefore, I extend warm and affectionate welcome to each and everyone of the heads of government and heads of state who are here. I greet President Park Chung Hee of the Republic of Korea. I greet Prime Minister Thanom Kittikachorn of Thailand. I greet Chairman Nguyen Van Thieu of the Republic of Vietnam. I greet Prime Minister Nguyen Cao Ky of the Republic of Vietnam. I greet Prime Minister Harold Holt of Australia. I greet Prime Minister Keith Holyoake of New Zealand. And I greet President Lyndon B. Johnson of the United States of America. We extend welcome to the members of their delegations, and especially to the fair ladies who are here in this gathering. The presence here alone of the heads of government and the heads of state is to me a great achievement. That we may meet and seek common council is to me a step-forward as we advance the frontiers of human nobility, and that the greatest nation on earth, the United States of America, has come upon the invitation of the Asian nations, not only to advance the cause of peace but to raise her voice in order that there may be stability in our part of the world; that we may meet the problem of hunger, disease and ignorance which is the cause of discontent; this to me is a tribute to American sincerity and the validity of Asian aims. The whole world realizes the almost insurmountable obstacles in your respective countries that could have prevented your coming here or could have been utilized as an excuse, a valid excuse for non-attendance. It is, therefore, fitting that I point out that the presence here of – President Johnson is eloquent proof of a momentous factor in the world situations, and that is the generous acceptance of the United States, its enlightened decision to accept its share and participation in the establishment of stability and security in Asia. For this, Asia thanks the President of the United States of America. For he has come as he has well said: to listen, to participate, to cooperate. And he has come to expose himself to Asian feelings and Asian thoughts and Asian aims. And this indeed establishes the fact that it wishes to play a constructive role in Asia today as it turns its face towards this area of deprivation. The participation of the Prime Ministers of Australia and New Zealand must be noted. For it constitutes a hopeful augury. They are our neighbors by the accidents of geography, but our own brothers, allies, and partners by their own deliberate choice. Developed more than other Asian countries, they are as deeply committed to the freedom and prosperity of Asia and we know that they offer great contributions to the noble objectives of this conference. The presence here of Chairman Nguyen Van Thieu and Prime Minister Nguyen Cao Ky of Vietnam, President Park Chung Hee of Korea, as well as Prime Minister Thanom Kittikachorn of Thailand certainly indicates the confluence of the vital interests in this conference of the nations that border the Pacific and the Chinese mainland, the area and region which today is the most sensitive and the most important in the eyes of observers of the international scene. 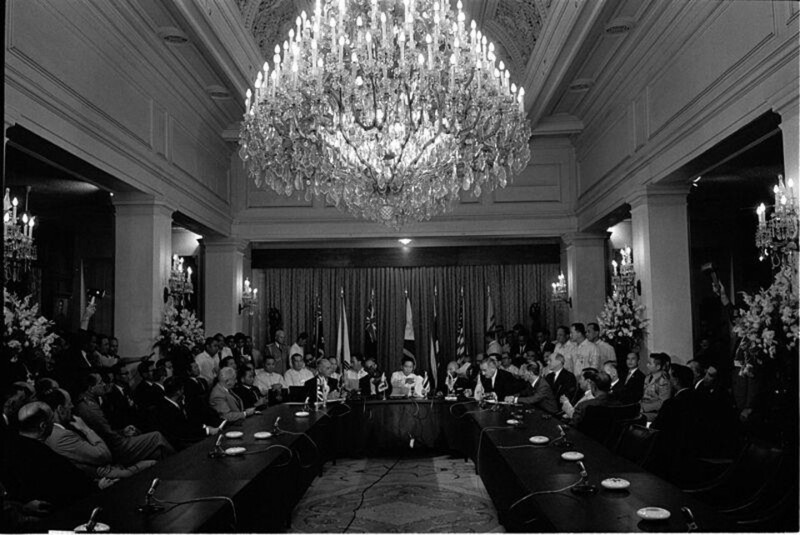 Thailand, South Vietnam, Korea, and the Philippines have suggested that this meeting be called. And it has been agreed that this was the proper forum in which to discuss a common stand on the bitter conflict that now rages in Vietnam. We have been drawn together by the council of faith and hope. And if our will is strong and we dedicate all our resources to this purpose, we will succeed. The attention of the world is focused upon us, the skeptics as well as the believers. But the men of goodwill of this world pray that we shall be able to raise the conference to the summit not only of hope but also of probability and achievement. This council must be a council that shall attain better understanding. It must be a council that shall present a plan for a better and more prosperous Asia. It must be a council that shall seek food for the needy and hungry, that it shall establish and fashion a plan for education for the ignorant and illiterate. It must be a council that shall seek the causes of war and attempt to eradicate them. Thus, this council shall be known in history as a council of peace and not a council of war. For the peoples of Asia have borne the deadly, crushing weight of deprivation for centuries. And in the uncountable millions of heart not only in Asia but all over the world, there is a unifying reason, there is the deep tender yearning for a little more stability and a little more comfort and food. The world needs peace. But if Asia must be saved, we must establish peace in Asia. Asian nations have had a surfeit of violence and war. Their deepest longing is not only for security and stability. Their deepest longing is to be able to work without any threat of reprisal, to sleep without any fear of death, to care for their young without any fear of separation, and over and above all, to be able to choose their own kind of government and their own kind of society. But on the other hand, the peace that Asia seeks is not the peace of betrayal nor of death. It is a peace that would allow an option to each and every country, whether Asia or not, to choose its own form of society, an option to freedom and liberty, the liberty and freedom that will allow the full development of God endowed faculties to each and every man. Understanding will come not as a victory of one side of a conflict but as a victory for all, in which all humanity can share, and this is the dream that we seek. Thus, the objectives of this conference are those that have been set. Vietnam, Korea, Thailand and the Philippines have suggested this conference as perhaps the first painful step that we must take in order to attain the dream that I speak of. Before we can realize negotiations with the Communists, it is necessary that the allies of South Vietnam and South Vietnam itself come together and adopt a common stand. It is necessary that the seven nations in Vietnam fashion a plan for the development of Asia that shall eradicate the causes of war not only in Vietnam, not only in Asia, but throughout the world. We extend a hand conciliation across the China Sea from this coastal city to North Vietnam. But it should respond and it should respond not with the usual spate of slander but with some manifestation of goodwill. The good faith of the nations here has been manifested by the fact that we have not waited for such response from the enemy to start these deliberations. The conference shall proceed in disregard of invectives from our detractors, nor of the sarcasm of our detractors. We shall proceed and seek to attain these noble objectives that we have set for ourselves. We hope that this conference shall present a general disarmament plan for the development of all of Asia and all the countries of Asia. We hope that in any gathering that involves Asia, Asia shall be consulted. For there is a fresh new wind that sweeps over the face of Asia; its peoples are more perceptive, its leaders are more dedicated, passionately, to the interest of their people; and Asia can no longer accept western formulas without questioning or participation. Asia hopes that it shall be given participation in the determination of its own destiny. The Asian Development Bank now rises to my mind and reminds me that perhaps the charter of this bank may well be the Magna Carta of Asian prosperity and stability. If we unite behind this idea, the Asian Development Bank may well be the beginning of a new and prosperous Asia. It may well illuminate the causes of war. It may well be the starting point for the eradication of the causes of war. It may well exterminate such causes and ultimately bring about only the prosperity of Asia but also the stability of the entire world. However, experience has taught us that the pursuit of goodwill is a long and tedious process. This conference is but the beginning of such a process. Realities also compel us and caution us to understand that miracles cannot be attained within the short span of these two days of conference. However, the stakes in Vietnam go beyond Vietnam, go beyond Asia, into the world and, therefore, we must persist upon this search for universal brotherhood. And if we shall be able to fashion a plan to illumine these causes of war and bring to the attention of all the nations and peoples of the world such causes, we shall move forward towards the ideal of universal brotherhood. So, today we are here to seek a new summit in the world’s aspiration for a life without war. No conference of heads of state has set a more noble vision nor a more urgent one. Let the historians, therefore, record that we have gathered here to meet this challenge and that we have done our share in the pursuit of the ideal of a universal brotherhood. The skeptics and the fatalists know not the agony in Asia but we do. And so gathering all our strength even as against a world of discouragement, we shall accept the odium and the stigma that our detractors would seek to attach to this pursuit of universal brotherhood. And doing so, we can only say that no man quiet his conscience unless he pursues with vigor every opening and opportunity that is granted him as an avenue for the attainment of peace. And so today, let the historians also record that with a prayer in our hearts we come to articulate the vague, groping yearnings of the mute, silent and suffering multitudes of the earth; the multitudes that do not participate in grave decisions, perhaps have no interest in the causes of conflicts but still must suffer the casualties of war. For these multitudes, we come to offer and will offer the best that is in us, all that we can muster of human courage, human wisdom, human resourcefulness, human ingenuity, human love, human compassion; and beyond this, no mortal on earth can offer more. To each and everyone of you again I say, greetings, "Mabuhay", and thank you.